Are you looking for unique wall words that tie in with your decor theme? Look no more. We have what you are looking for! At DecorativeLettering, we have wall words that are suitable for Valentine’s Day. We have these two colored wall letters for you. 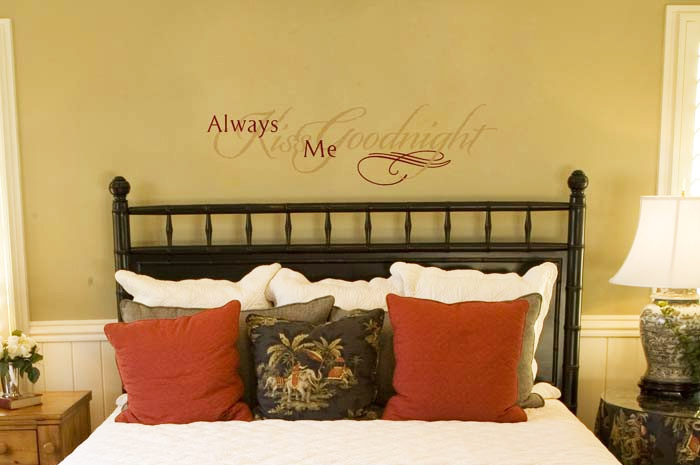 ‘Always kiss me goodnight’ wall decals look great in this bedroom. The potted plants and the red and light brown color themes give this room a tropical feel. The swirls on the wall lettering also influence the mood in this bedroom. This is a lovely and cozy room. Our wall quotes do look painted on! This is because they do not leave any marks around them on application. They are also durable, not affected by extreme temperature changes and easy to maintain. They are as good as new in winter as they are in summer! Check us out on our website and place your order. You will end up with wall words that are of high quality and affordable. Our wall words are also suitable for all light situations. We recommend matte wall lettering for well-lit rooms. This will enable you to view these heartwarming wall quotes without any glare problem. DecorativeLettering products are durable and resistant to extreme temperature changes: very appropriate for all seasons. Taking care of them will be a breeze! Do call or email. We would love to help you decorate with wall decor that will help you decorate with a theme of your choice.